Simple easy to follow techniques for drift fishing for catfish. Drift Fishing For Catfish from Learn To Catch Catfish covers everything you need to know to get started usinhg drifting techniques. Everything from boat control, tackle and gear and when and where to drift fish is covered in drift fishing for catfish. 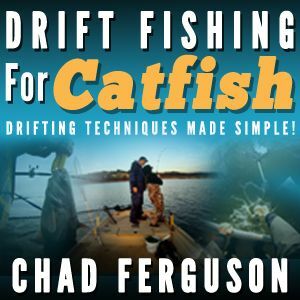 Drift Fishing For Catfish from Learn To Catch Catfish covers everything you need to know to get started catching catfish using drift fishing techniques. Drift Fishing covers the basics of bait and tackle to use for each species of catfish, boat control devices, drift fishing techniques to use, when, where and how ti locate areas to target when drift fishing and more.